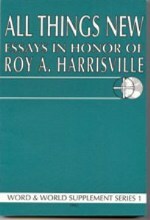 All Things New is an apt title for this collection of essays in honor of Dr. Roy Alvin Harrisville. His Princeton doctoral dissertation was entitled The Concept of Newness in the New Testament. Furthermore, his own work has remained innovative throughout the decades which precede his 70th birthday, and Dr. Harrisville will always remain young at heart. His students, colleagues, and friends join in thanksgiving for him and present these essays with deep respect and enduring affection.